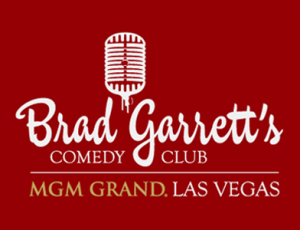 Best Price Guarantee | Vegas.com: If you purchase your tickets via the link provided on this page and find a better price for Brad Garrett's Comedy Club tickets for the seats purchased, Vegas.com will match the competitor's price and refund the difference. That’s customer care you can count on. Brad Garrett's Comedy Club features an old-school vibe where guests can laugh the night away to performances by established comedians and up and coming acts. Best known for his role on the Emmy award-winning sitcom Everybody Loves Raymond, Brad Garrett returns to his Vegas roots with his comedy club at the MGM Grand. Garrett started performing in Vegas in the '80s as an opening act big-name performers including Frank Sinatra, Sammy Davis Jr. and Liza Minnelli. With almost 25 years as a headliner on the Las Vegas Strip under his belt, Garrett always wanted to open a club in the city that helped launch his career. Special guests make frequent appearances, so there is a chance you might miss the funnyman himself.